Join us for the final meal of the year as we unceremoniously throw 2018 out and welcome 2019 with open arms! Grab your tickets today...They sell out every year! Plus you can watch the fireworks from our front steps. Philly Legend, DJ Jon Gill will be on the decks from 8p till close playing all your favorite party jams! Sit for a spell and have some brew at Lucha Cartel's Halloween Festivities! $5 Hornitos Silver shots & $7 Bloody Orange Hornitos margaritas all day. NO WORK THE NEXT DAY- NO SCHOOL - NO EXCUSES! 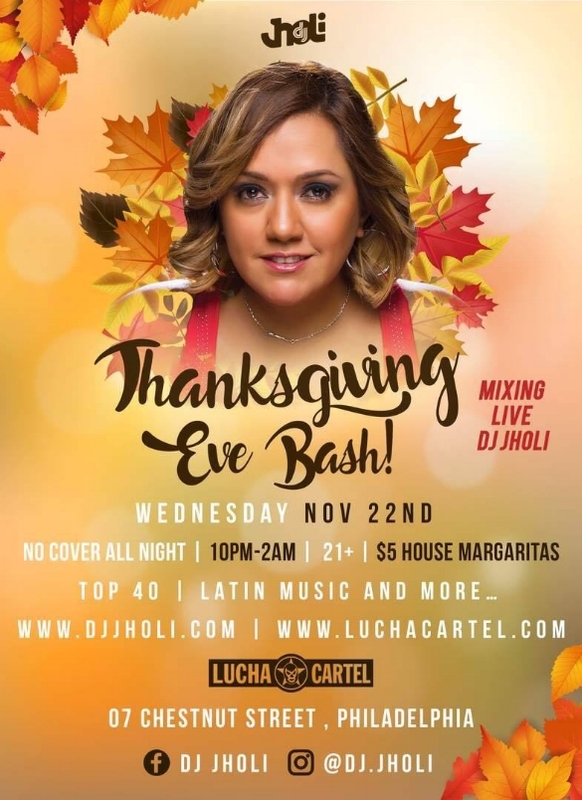 with DJ Jholi spinning top 40, Latin & all your favorite party jams! Wed, Nov. 1st, Dia de los Muertos...Dine for a cause! Chef Garcia will be spearheading a fundraiser dinner to benefit those impacted by the earthquakes in Oaxaca and Chiapas, Mexico. ALL proceeds from our dinner will go to the cause. We will be serving our regular menu as well as a $30 prixe fixe menu. For the prixe fixe, Chef will create several courses based on authentic Mexican recipes (see below). ---ENSALDA DELA CASA // crispy romain lettuce w/ corn dressing, fried onions & cotija cheese. ---AGUACHILE DE CAMARON // spicy shrimp ceviche w/ jalpenos, onions, cucumbers & cilantro. Served with saltines. ---ENCHILADAS DE MOLE // three chicken enchiladas topped with our house-made mole, queso fresco, onion & mexican crema w/ side of rice. ---BIRRIA DE RES // slow cooked, lightly spicy beef stew served w/ cilantro, onions & radish. ---PESCADO SARANDEADO // grilled marinaded fish served w/ rice & avocado salad. topped w/ sweet platains, pickeled onions, & manzano salad. red peppers & mint pesto. Topped w/ queso fresco & huitlacoche sauce. Served w/ white rice. ---COCONUT RICE PUDDING // traditional Mexican rice pudding w/ ginger & coconut milk. Served w/ a Chocolate Pirulli. ---CAJETA CHEESECAKE // creamy cheesecake made w/ Cajeta (Mexican Caramel) & served w/ peaches, strawberries, & whipped cream. Use OpenTable...Click the link below! Mother’s Day is your once-a-year opportunity to shamelessly thank Mom for everything she’s done. A holiday honoring motherhood and the countless, inevitable struggles that were overcome to ensure happy little babies everywhere can become happy little humans. The American incarnation of Mother’s Day was created by Anna Jarvis in 1908 and recognized as a U.S. holiday in 1914. Although dates and celebrations may vary, Mother’s Day traditionally involves sharing flowers, cards and hugs for the special Moms in your life. For many, breakfast-in-bed was the norm for Mom’s Special Day. Soggy toast, over-cooked eggs and lukewarm orange juice – YUM. This year, Lucha Cartel has food covered... All you have to do is bring Mom! Oval Tortilla topped w/Black Bean, Pure Scallions, Ham Habanero Tomato Sauce, Sliced Avocado & a Sunny Side Egg. Diced Sweet Potatoes, Malanga, Idaho Potatoes pan fried w/onions, melted Chihuahua Cheese, Fried Egg & Ranchero Salsa. Grilled Brioche served with melted White Cheddar Cheese, Mexican Chorizo, Arugula Salad & a Sunny Side up Egg. Fried Green Plantains sandwich stuffed w/Manchego cheese, topped w/Short Rib & an Almond Cumin Sauce. Join us for Cinco Weekend 2017! The festivities kick off at 4pm on #CincoDeMayo! -Late Night Happy Hour from 10pm-midnight ft.
Come thru & #Fiesta with us Amigos! Feliz Cinco De Mayo from Lucha! Ring in the New Year with not one but 2x the celebrations! Join us & our sister restaurant, National Mechanics as we party into the New Year w/ One Party, Two Bars! -Big screen viewing of NYC ball drop at Midnight w/ champagne toast! And over at Lucha Cartel it's Nochevieja! -Big screen w/ NYC ball drop at Midnight + champagne toast! End 2016 and start the new year with a bang at National Mechanics & Lucha Cartel! Mexican food is delicious & can be healthy too! You partied all summer, put a little weight on & that "Summer Body" isn't looking so hot at the moment. Now that Fall is upon us it's time to get your healthy on once again! Who said healthy food has to boring & bland?! Just because you're watching what you eat, doesn't mean you have to miss out on a night out with your crew! You can still come to Lucha & enjoy the best mexican food in the city! Here's our tips, tricks & menu items so that you can dine at Lucha on the healthy tip! This combo seems harmless but chips & salsa contain calories that definitely don't fit into any good diet plan & before you know it, you've eaten the entire basket & you're not even hungry when your food gets to the table! Save yourself the temptation and just say "No Gracias"! Hard shells are normally fried and contain extra calories that could push you over your limit. It may be hard to say "Adios amigo" to such crunchy deliciousness for the time being but it's totally worth it when you have those six pack abs! If you choose to dig into a bean dish (which can be a healthy option) Go for the black beans! They are high in fiber, potassium & vitamin B6 plus they help lower your cholesterol & decrease the risk of heart disease and if pinto beans are available, they are definitely a good choice too. They are an excellent source of protein, healthy carbs & iron. Keep an eye on your serving size & you will keep your calorie count where it needs to be! 4: Cut back on the Sour Cream & Guac! We know the toppings are usually the best part right?! All we're saying is...Spoon on a little less! Guacamole is made from avocado which is source of what they call "Good Fat" but calories are calories so just go easy. Maybe just use salsa instead! It's a lower-calorie option & provides important nutrients that you need! 5. Drink Tequila on the rocks with a lime instead of that Margarita! We know, we know...Margaritas are awesome, delicious & most likely just what you need after a long work week but it's a complete diet downer & it will definitely put you over your calorie limits. Just stick with straight Tequila...Not exactly the same but in the long run you'll be happy you did...Stick to your plan! Plus we have over 40 kinds for you to choose from. 6. Choose your protein wisely! You're most likely getting some sort of protein w/dinner but they are all not created equal people! Chicken is always the best option. You exclaim..."They have Ensalada!" Yes you would normally think "salad" is the obvious choice if you are watching that waistline...However, "salad" does not go hand & hand with "healthy." Depending on what's on it, you're better off having a soft taco or 2. One of the keys is to watch how much you are chowing down on...Portion size people! So the next time you and your friends are down for some amazing Mexican food at Lucha...Don't forget these tips! Here's some of our yummy healthy options here at Lucha! Avocado Salad...Avocado is packed with healthy fats & is super delicious. The key to any salad is watching the amount of dressing you use. Add some chicken for a good boost of protein! Chicken Tacos...Keep it simple & don't add on extra calories with a tons of Sour Cream...Stick with the housemade salsa it comes with as a topping or you could always ramp it up a bit with some hot sauce! If you're vegetarian we got you covered! Sweet Potato or Portobello Mushroom Tacos are it, just say no to the queso! ! Ceviche...Give one of our ceviche's a try. We offer either Sea Bass, Red Snapper or Shrimp. All are are a light, fresh and delicious way to end your meal & it's super good for you! Fajitas...Our Chicken fajitas are always a really great option! They allow you to control how much you eat & you can always ask for a side of sliced avocados or salsa instead of the cheese & sour cream! Join us for not one day of Cinco celebrations but 4 DAYS! The festivities kick-off of course on Cinco De Mayo! $5 Food & Drink Specials ALL DAY! Come shake those Maracas w/DJ Ricky Via spinning all kinds of party favorites...No cover & Late Night Happy Hour till midnight! The Cinco Closing Bash w/DJ Oskar Zuara...Our drinks specials & dancefloor jams will be sure to get that booty movin' for our final Cinco celebration! Come thru & Fiesta with us Amigos! We Luchadore you here at Lucha Cartel so we decided to put a little something together for you & that special someone this Valentine’s Day Weekend! Join us February 12th thru 14th for something exciting and romantic! 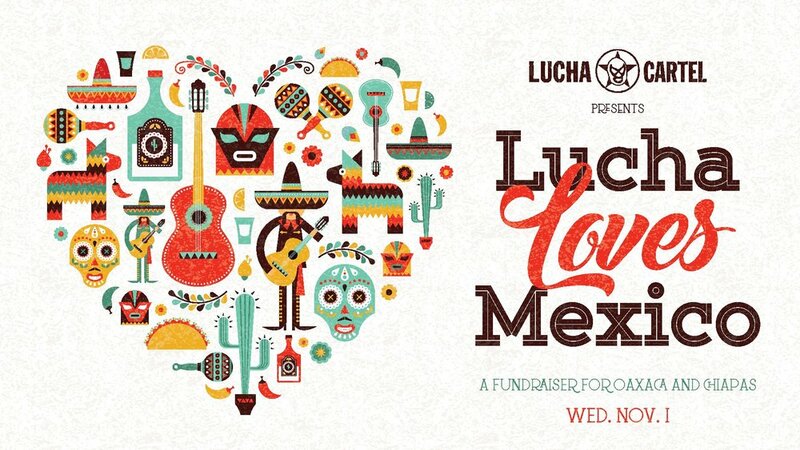 On Valentine's Day...Sunday, February 14th between 6:30 and 8:30...We will have a Mariachi serenade! Happy New Year from all of us at Lucha Cartel & National Mechanics! Join us as we ring in the New Year...1 Party, 2 Bars! Let's eat the final meal of the 2015 together! -DJ Kevin Kong will be spinning 10pm till close. National Mechanics NEW YEARS EVE! -Top Shelf Open Bar from 8-12 with specialty 2016 NYE Cocktails and a Midnight Champagne Toast. -We'll be watching the ball drop on our big screen and checking out fireworks on the front steps. Let's Ring in the New Year Together at Lucha Cartel & National Mechanics! Shots for Tots...ALL December Long! Shots for Tots is back for year number two! Fill a 10-ounce glass with ice. Scatter salt on the ice, then pour in the tequila, hot sauce, Clamato, and lemon juice. Top up the glass with grapefruit soda and stir gently. Garnish with lemon and serve immediately. 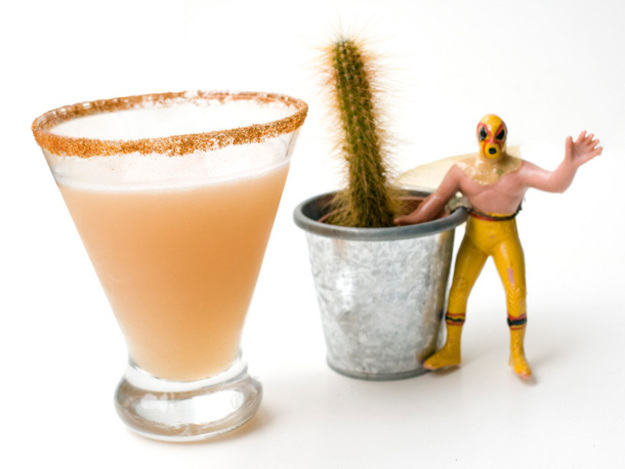 This margarita is quite tart and refreshing, with the slightly earthy notes of tamarind and cinnamon coming through. Use a good 100% agave tequila, either blanco or reposado. The spice of the tequila echoes beautifully though this cocktail, and a little Cointreau adds a hint of orangey sweetness. You can use tamarind concentrate, which comes as a thick liquid in a plastic jar. If you can only find tamarind blocks, don't worry. Submerge an inch or so of the block in a few tablespoons of hot water for fifteen minutes. Mash to loosen, and discard any seeds or undissolved solids. Mix sugar, salt, cayenne, and cinnamon in a small bowl, then pour onto a saucer. Pour 2 tablespoons lime juice onto a second saucer. Turn serving glass (martini glass or old fashioned) in lime juice to coat the outer rim. Then spin glass in cayenne mixture, rotating slowly to coat. Add tamarind concentrate, tequila, lime juice, simple syrup, lemon juice, and Cointreau to mixing glass. Fill with ice and shake well, about 30 seconds. Strain into serving glass. Garnish with cinnamon stick if desired. This sweet-and-sour spin on the classic Paloma. A generous dose of freshly squeezed orange and grapefruit juice brings this cocktail to life. Fill a large glass mug with ice. Add salt, tequila, lime, orange, and grapefruit juice. Stir gently. Top off with grapefruit soda, add agave nectar to taste and garnish with lime wheel. This easy-to-make and easy-to-sip drink is basically a "silver Tequila Collins." It's crisp and light...Perfect for a hot day...A healthy sprig of mint adds aroma and you can decorate the glass with thinly cut lemon wheels if you want to get fancy. This is a spin on the Hemingway Daiquiri. Tequila adds warmth to bitter Campari; it's a luxurious cocktail that's a bit like sipping candied grapefruit peel.